Even though rally champion Travis Pastrana announced his new partnership with Chrysler and SRT Motorsports which has him racing the new 2013 Dodge Dart Rally Car just over a week ago, we already have our first (rally good) look at the new Dodge compact race car in action – tearing around the Chrysler Chelsea Proving Grounds in a Ken Block style video. Based on the fact that rally racing doesn’t get as much mainstream media attention in the United States, teams have to go the extra mile to bring attention to the sport and that is exactly what this new video featuring Travis Pastrana’s 2013 Dodge Dart Rally Car does. Ken Block’s popular gymkhana videos, showing the rally legend pushing his Ford race cars to the limit, have done great things for the popularity of the sport while also promoting the newer Ford racing teams. 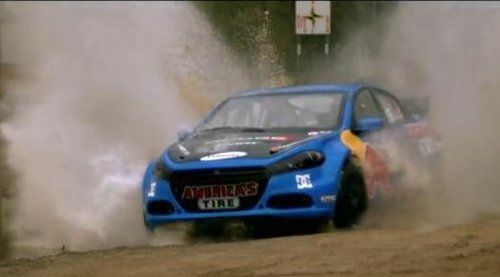 This new video from Pastrana Racing packs all of the slow motion action shots and deafening roars of the turbocharged 4-cylinder but for the first time – it is an all wheel drive Dodge Dart sliding across the concrete and storming through the muddy water. In addition to giving us a great chance to see and hear the 600 horsepower 2013 Dodge Dart Rally Car in action, this video offers a first look at the race livery that will likely adorn the car when Travis Pastrana takes to the track of the Global RallyCross series next month. The initial images of the Dart Rally Car showed the car just wearing SRT and Dodge logos but it looks as though the big name racer Pastrana brought with him some big name sponsors – namely tire retail giant Discount Tire along with action sports regulars Red Bull and DC Shoes. Red Bull makes a habit of doing everything that they can to show off the race teams that they sponsor so in addition to having a great looking car and a championship caliber driver, the new Dodge Dart rally program could benefit from the sponsorship deal with Red Bull. The video below of Travis Pastrana in action behind the wheel of his new 2013 Dodge Dart Rally Car might not have quite the level of theatrics that we see from Ken Block’s videos but consindering that this is the very first video showing the new Dart race car in action; this is sure to draw the attention of Mopar fans and the rally racing world as a whole. The video does show Pastrana drifting around the Chrysler Chelsea Proving Grounds, including a romp on the mud (that tore off the rear bumper cover), moving shots of the Dart throwing up some serious rooster tails, and a long, slow motion slide across a large open tarmac.